This is a fine example of the 1704 Guillaume De L'isle map of Swabia, Germany. It covers the northern portion of the Holy Roman Empire's Circle of Swabia from Nuremberg south to Wertingen and from Stuttgart east as far as Rain. The map renders the entire region in extraordinary detail offering both topographical and political information with forests and mountains beautifully rendered in profile. The 'circles' of Germany are the 'imperial circles,' administrative units created for tax and defense purposes by the Holy Roman Empire, of which these areas were a part. Prior the French Revolutionary Wars and the Congress of Vienna, the Holy Roman Empire's Circle of Swabia was bordered by Franconia, Bavaria, Palatinate, France and Switzerland. Since the Reformation, the region had been one of the most divided in Europe, with secular princes and Free Cities becoming Protestant, and the ecclesiastical territories (including the bishoprics of Augsburg, Konstanz and others) remaining Catholic, as did the territories belonging to the Habsburgs, Hohenzollerns and the Margrave of Baden-Baden. The Napoleonic Wars dissolved the Holy Roman Empire in 1806, leading to Germany's eventual consolidation in 1871. With a reputation for being extremely serious and hardworking, Swabia has produced many famous native sons including Einstein, Brecht, Hegel, Kepler, and of course, Roland Emmerich. 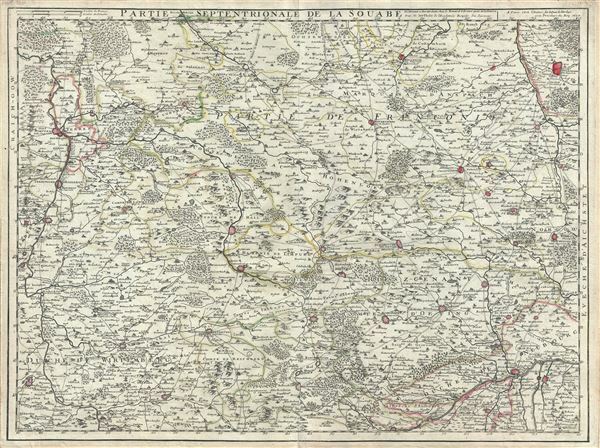 This map was created by Guillaume De L'isle in 1704. Very good. Minor wear along original centerfold. Original platemark visible. Minor foxing at places.